Please note: this Trek Checkpoint ALR 4 is available for in store collection only. This is a global policy of Trek Bicycles. If you would like to purchase this model we recommend using our Click & Collect payment method to reserve your bike online. 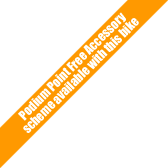 This Trek Checkpoint ALR 4 2018 is available with our legendary Podium Point free accessory scheme. Trek's Checkpoint is a gravel road bike designed with high-quality parts that will that hold up for long, rugged miles on pavement, dirt, and even the most treacherous gravel roads. Checkpoint combines the speed and stability of a road bike with the rugged offroad capability of a cyclocross bike. It also comes ready to roll with a wealth of adventure-ready features, like adjustable Stranglehold dropouts, massive tyre clearance, and extra mounts that make it super versatile and easy to customise. Geometry is comfortable for the long haul and rough roads, but aggressive enough to provide the speed and ride-feel most gravel riders are looking for. Compared to Trek's Boone cyclocross race bike, Checkpoint features a nearly identical reach, slightly taller stack, and lower bottom bracket height. Chainstay length and wheelbase are the same. The lower bottom bracket provides the additional stability at speed, while maintaining a tight wheelbase, long reach, and relatively low stack height keeps Checkpoint fast and manoeuvrable. Stranglehold dropouts allow the rider to adjust the bike's geometry and gearing based on the requirements of the day's ride. For example, the longest setting makes the bike more stable for longer rides and bikepacking. The dropouts also allow for quick & easy conversion to singlespeed. The stock 35mm tyres hit the sweet-spot for a lot of riders, but running other widths quickly changes Checkpoint's identity. The rider hitting crushed limestone trails to link pavement will love firm and fast-rolling 28mm slicks, while the dedicated dirt road explorer can go up to 45mm to tackle the ruttiest, rockiest routes. Checkpoint is covered in mounts. Mounts on the seattube and downtube allow riders to fit three bottles in the main triangle, or position two bottles low while leaving room for a frame bag. There's also room for one more bottle under the down tube. Lowrider fork mounts will take a rack & bags. Rear rack mounts give more room for cargo, and hidden fender mounts keep the ride clean in even the worst weather. The Trek Checkpoint is the bike to fulfil your imagination. Bontrager alloy sealed bearing, 12 mm alloy axle, CenterLock. Bontrager Tubeless Ready rims.